This is the website of www.maritiques.com Our postal address is P.O. 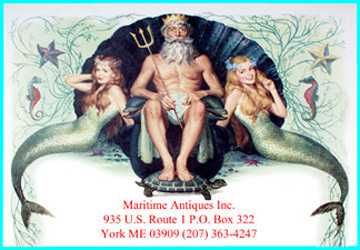 Box 322 York ME 03909 We can be reached via email at soldbuyus@maritiques.com or you can reach us by telephone on (207) 363-4247 At no time will your information ever be shared, sold or released. We collect information volunteered by the users for site issue regulations, promotiional events. If you do not wish to receive email from us in the future, please let us know by sending us an email at: remove@maritiques.com If you supply us with your email address you may receive periodic mailings from us with information on new products or services or upcoming events. If you do not wish to receive such mailings, please let us know by sending an email to remove@maritiques.com Please provide us with your exact name, address and email address. Your name and contents will be removed from all of our mailing list. Upon request we will provide Users with access to their contact information (e.g., name, address, phone number) that we maintain about each user. If you feel that the site is not following its stated information policy you may contact us on the above addresses or phone number.